Liv Re-Gen is a real treat for your Liver & Gallbladder that contains 100% Natural ingredients formulated to help Flush out alcohol & cholesterol built up and trapped in your Liver & Gallbladder, designed to help cleanse, support cell repair, BOOST bile production, improve digestion whilst reducing stomach bloating & abdominal swelling. 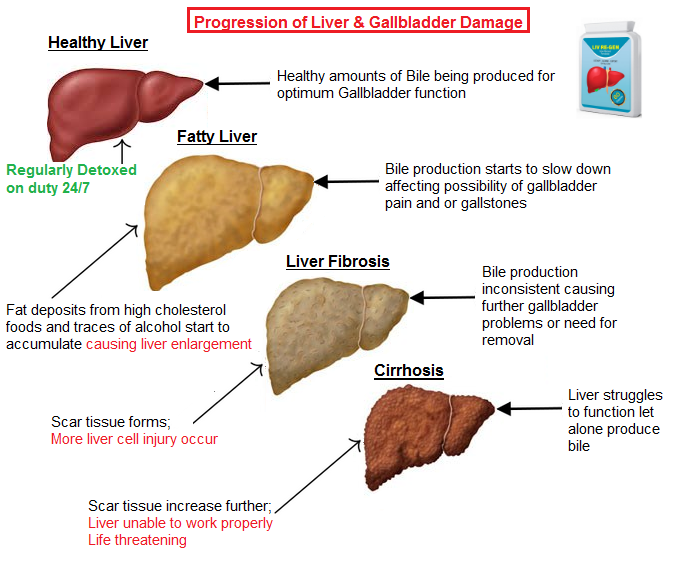 If you are suffering from liver damage or a specific liver condition right now there is hope, because an interesting "Proven" scientific fact about the liver is... its a very special organ inside the human body... that when cared for by consuming the right type of nutritional foods on a daily basis for a minimum of 120 days has the ability to re-generate itself fully. WORLDWIDE SHIPPING + FREE Delivery on ALL orders within UK & Ireland! I'd been having a stabbing pain for a year at the top of my liver ... I wasn't sure if it was my liver or I'd pulled a muscle in my right side. I'm not keen on going to the doctors ... somehow I saw these pills and within a few days of taking them the pain has never returned and I've been taking one or two a day with big meals. great product, pain gone. feel much better. would recommend. I have been taking for several weeks now and find they help enormously with bloating, lazy bowels, altogether overall feeling better. I've even got my husband on them as he was suffering with what he called 'feeling uncomfortable'. Especially after eating or drinking. He's now asked me to put another order in for him as they've worked for him too. Good fast service too. Not everything with a high rating has worked for me, as we're all different, but these have, so would definitely recommend trying them. I was feeling some pain around the liver area and got way too bloated and heavy after the holidays; guess my liver was out of business because of the cakes and wine abuse, have low tolerance for alcohol so this might have been the main reason for my discomfort. I came across these capsules and what caught my attention was the fact that they are 100% herbal, I was aiming for such supplements, the price was not so high so I decided to just buy them. Please believe me when I say that only after 3 capsules, there is no bloat and the pain is almost gone! I feel so much more lighter, no heavy feeling around my waist, no gas alerts, no funny taste in my mouth! Very easy to swallow, no aftertaste, no funny business in my stomach. I had them delivered way before the predicted date and I can honestly say I am very very pleased and satisfied with these capsules! Excellent product,problems more than halved,after taking a couple courses,shall continue for the perfect result ,very happy thankyou. I have had my gall bladder out and struggle to digest fats which is a real problem during summer with all the extra socializing accompanied by rich and creamy food. Am in the middle of my packet and will be placing another order. Feeling livelier, more energy and niggling aches and pains have subsided. I have had a few drinks(Xmas time !!) so aware I won’t be feeling the full benefit, but even after a few glasses of red wine at a dinner party, felt generally OK the next morning and healthier than usual. I am Looking forward to doing the full cleanse in february for 30 days. Being someone who eats a LOT of curries and takeaway junk food i feel bloated and have poor digestion, although I do go gym and do a lot of cardio I even have a lot of greens to balance it out, but it still came to a point that its time for dinner and Im still bloated from lunch.. Enter liv-regen.... it took 3 to 4 days taking one capsule after lunch meal and one capsule after dinner time and all I can say is WOW! I have been having more satisfying bowel movements, I can definitely feel my digestive system is working faster and my 3rd week in I have lost 5 pounds of weight and can see my midsection has shed some fat. These did the trick for me! Had a 'discomfort' (mild pain) in my right side, close to gallbladder and liver, which I'd had for several weeks. Also had frequent burping, digestive 'noises' in stomach etc. Definitely something amiss! Went to GP, was examined, and an ultrasound was arranged. Purchased and started using them, and the discomfort cleared up in about a week - almost miraculous. Went ahead with the ultrasound, no issues found, and no gallstones (which is what I thought it could be). Could all be a coincidence - however what can't be denied is the fact that I had the mild pain, and it cleared within a week of taking these - the digestive issues also cleared up! I'm still taking them. Ive also felt bloated and sice i started using this product i have received so much benefit so far.